Dr. Crawfod is a Louisville native. She graduated from the University of Louisville with high honors in 1984 and went on to graduate from the University of Kentucky College of Medicine in 1988. She then completed her Residency at the University of Michigan in 1992. Upon her return to Louisville in 1992, she began her private practice as one of the founding members of All Women OB/GYN (Formerly Women’s Health Care). Dr. Crawford now focuses her practice of medicine solely on Gynecology. She maintains her yearly Board certification as required by the American Board of Obstetrics and Gynecology. 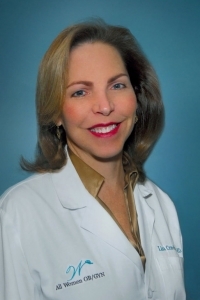 She is skilled in all forms of minimally invasive gynecological surgery including laparoscopic hysterectomies. She is also certified to operate with the da Vinci robotic equipment. Because of her concentration in gynecology Dr. Crawford also maintains certification with the International Society for Clinical Densitometry. This certification enhances her ability to evaluate and treat osteoporosis. Dr. Crawford is also active within the community giving group presentations and media interviews, in cooperation with local hospitals, to ensure that women have the very best forum possible to obtain current information and knowledge about advances in women’s healthcare.